Finally, after 2 years of its quick appearance at the 500L presentation, the new Fiat 500X is ready to be presented. The brand will reveal the 500-based SUV at Paris auto show in October but it has already started a teaser campaign that showed the shape of this new baby crossover. Based on the same platform of the new Jeep Renegade (on sale from October) the 500X is expected to hit the market in January and will certainly boost the weak Italian car production. Fiat will export it from Melfi, in Italy, to more than 100 countries, including USA. The car will be positioned just one step behind the Renegade in terms of price and performance, even if they both belong to the B-SUV segment. From the design point of view, the Fiat 500X will be the beauty-stylish small SUV option inside the group’s range (as the Jeep Renegade is more focused on those looking for SUV performance-feeling), and is supposed to maintain the body language of the small 500. 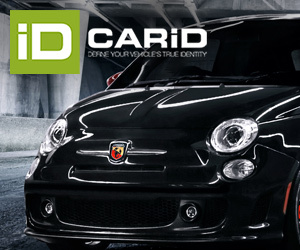 That would help it a lot as many Fiat 500 owners love their city-car but they don’t find anything similar but larger. The 500L has done a very good job becoming Europe’s best-selling small MPV, but it didn’t achieve the goal of being associated to the popular Cinquecento. Now is time for the 500X, which will benefit from a soft design and from an increasing demand of city-SUVs. However, how much is going to impact the arrival of the 500X on 500L sales? Two weeks ago Ford announced it halted production of its B-MPV B-Max at its Romanian factory. It isn’t the first time and the reason is low demand. 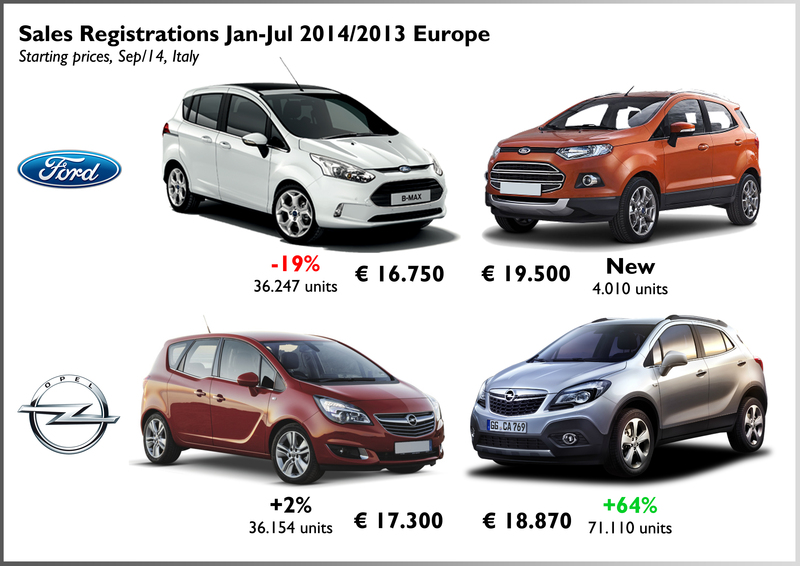 Europeans seem to shift their demand from small MPV to small SUV. 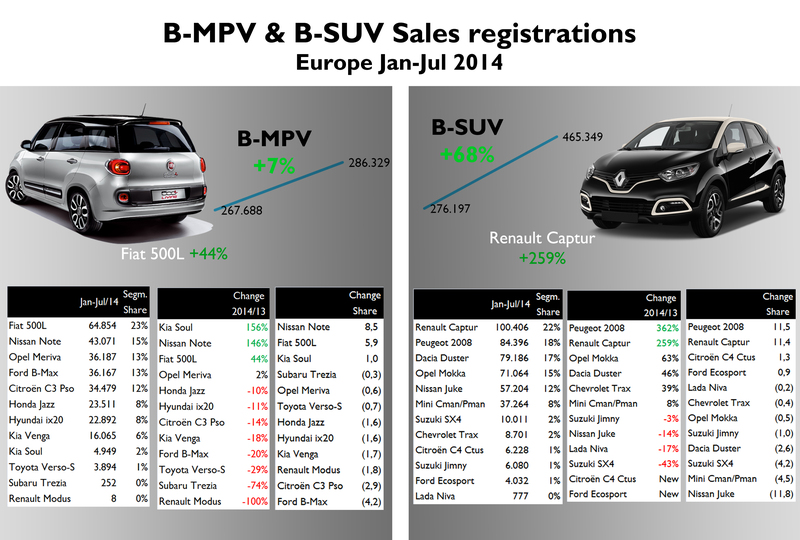 This is quite evident in upper segments: The C and D-MPV segments have been strongly affected by SUVs and crossovers. The consumer finds the SUV more useful and resistant than the roomy MPVs. Ford launched the Ecosport small SUV by the end of last year and it seems that it is the main guilty of B-Max’s sales drop. The problem can be the small difference there is between their prices. For the entry versions there are less than 3.000 euro difference which at the end isn’t that much between a regular car (an MPV isn’t exciting at all) and aspirational one (SUVs, small, mid-size and big will be always cool). The same could be happening to the Opel Meriva and Mokka. Will it happen to the Fiat 500L once the 500X takes off? how will Fiat manage this possible cannibalization? The possible conflict between both Fiat 500’s brothers isn’t related to their features. They are both quite different and clearly positioned. The 500L, 500L Trekking and 500L Living are focused on families by offering a roomy, comfortable and easy MPV. The 500X will have a more sporty personality and will use more of the 500’s soul. Therefore it won’t be particularly known for its roominess but for its design, design details and some sort of exclusivity/premiumness that none of its competitors have. If the Renegade is priced starting at 23.500 euro, the Fiat is expected to be offered at 19.500 euro for the entry version (2WD transmission). That would be 3.500 euro more than the basic 500L, 1.000 euro more than the 500L Trekking and the same of the 7-seater 500L Living. In that case Fiat would be facing the same problem Ford has to deal with, and the 500L range could start having some demand problems. Fiat has 2 solutions to avoid this possible scenario. It can reduce the 500L prices and in this way it can even become an affordable alternative for those that consider the Punto as too old. Or it can reposition the small MPV based on its best attributes: roominess and comfort. The consumers must understand the clear advantages of a MPV and stop thinking of it as a boring solution for families. This is valid for Europe and USA, where for sure the 500X will definitely outsell the small minivan. Therefore the positioning of the 500L must be redesigned so the arrival of the 500X will become not a problem but a volume-generator for Fiat. The Fiat 500L Trekking is going to be first negatively affected with the arrival of the Fiat 500X. 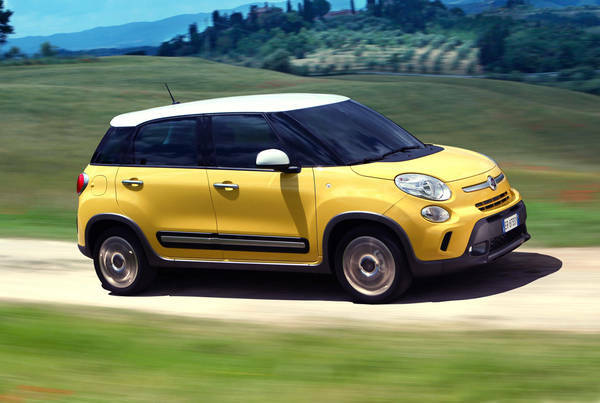 It will be located between the versatility of the 500L and the capable 500X. ← FCA vs. VW Group: David against Goliath? The Punto is 9 years old, yes … but the 500 is only two years newer. Juan, i wonder whether the 500L and the 500X are at all viable for ’emerging markets’? Or is the Jeep Renegade and the upcoming Jeep Compass-replacing C-SUV the way to tap the premium-end of the emerging markets? thysi, the 500 is ageless! 🙂 And the Punto has, to be fair, aged rather well. The India-specific new Punto Evo remains the most ravishing-looking, and lovely driving, in this hatchback market. FCA will use the Renegade/500X for global exports and local production in Brazil and India. There may be some adaptations to local needs, but the group points at small SUV for its international growth. There are reports of a Fiat Brazil-developed, emerging-markets-only, Ecosport/Duster rival small CUV being brought for manufacture to India. And of course the Jeep Renegade and/or new Jeep C-SUV. But will the 500L and/or 500X make sense for local manufacture in markets like India, China, Brazil, or is that premium-global role only for Jeep, i wonder? The Jeep will have the premium role in SUV segment, while Fiat with the 500X will be positioned one step behind. With some adaptations, the 500X could have a relevance in those emerging markets. They may change the name, but the base will be the same: a city-Crossover which is becoming very popular not only in Europe, but in USA, India, China, Russia and Brazil. Almost two Years after this very nice post, what is your conclusion juan? It seems to me that the 500l was able to mantain a good selling rate: from the peak in 2014 of over 90.000 500l sold in eu, a bit over 82.000 in 2015 and I expect a bit less 70.000 in 2016. Most of these have been sold in Italy (and Spain) where I imagine often substituted the still alive punto. I do not know which future the car will have, but apparently people still like the formula and the pricing. Hello Efrem. Thanks for your message. The 500L is mostly sold in Italy. However it has not had good results in other markets such as the UK and USA. The car will get a facelift this year but I’m afraid it won’t have a successor at the end of its commercial cycle.